Email marketing is one of the most effective and cost-efficient forms of online marketing you can implement in your business. How you implement it, however, plays a huge role in its effectiveness. It isn't enough to place a simple sign-up form on every blog post you publish asking visitors if they'd like to “subscribe for more updates”. You need a better strategy. Enter MailOptin. 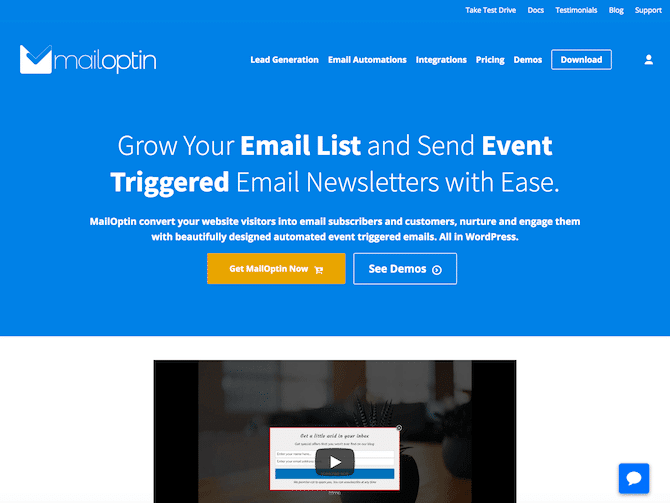 MailOptin is a lead generation software and plugin available exclusively for WordPress. It has enough tools and features to give you the ability to grow your audience and engage your subscribers. We're going to take a look at this plugin and review its best features. Let's start with a features overview. What happens if you don't integrate your service provider? 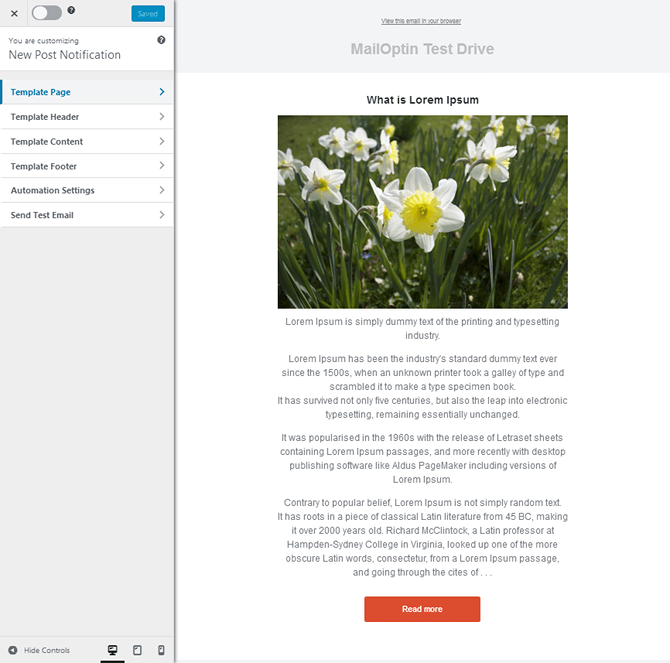 MailOptin has a free version available directly from the WordPress plugin repository, but we're going to focus on the premium version in this review. Here's an overview of the plugin's top features. 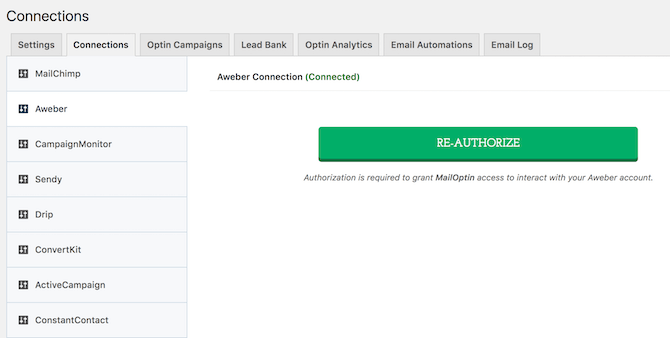 Lead Generation – MailOptin gives you the ability to generate leads with a variety of forms. They are lightbox popups, notification bars, slide-in popups, widget forms, before/after forms, inline forms, exit-intent forms, scroll-trigger forms, link-trigger forms and timed-delay forms. Campaigns – Create multiple campaigns designed to generate leads with different strategies and different goals. Target Marketing – Showcase specific offers/forms based on the page or post a reader views. Post Notifications – Automatically send an email to your subscribers when you publish new blog posts. Weekly Newsletter – Called an “email digest” in this plugin, this feature allows you to send a newsletter filled with your latest posts to your subscribers on a weekly basis. Alternative Settings – Create different rules for the way your forms behave based on whether or not users are logged in, whether they're a new or returning visitor, whether or not they use ad-blocking software, or where they're coming from (referrer detection). Analytics – View metrics that tell you which campaigns, pages and forms have the highest conversions, clicks and impressions. A/B Split Testing – Test different versions of forms with this plugin's built-in split testing feature. Sleek Styles – Choose from an assortment of sleek, pre-designed templates, and customize them to your heart's desire. Animations – Called “DisplayEffects” in this plugin, these are 30+ CSS3 animation effects you can add to forms to engage readers or grab their attention. Optimized for Mobile – All forms are optimized for mobile devices automatically. Integrations – This plugin integrates with multiple email marketing service providers, including ActiveCampaign, MailChimp, Aweber, ConvertKit, Campaign Monitor, Constant Contact, MailerLite, GetResponse and Sendy. This is still a growing plugin. However, you can clearly tell by this long list of sophisticated and even somewhat ambitious features that it's fully capable of competing with similar plugins. Let's continue this MailOptin review and talk about how it feels to use this email marketing plugin. 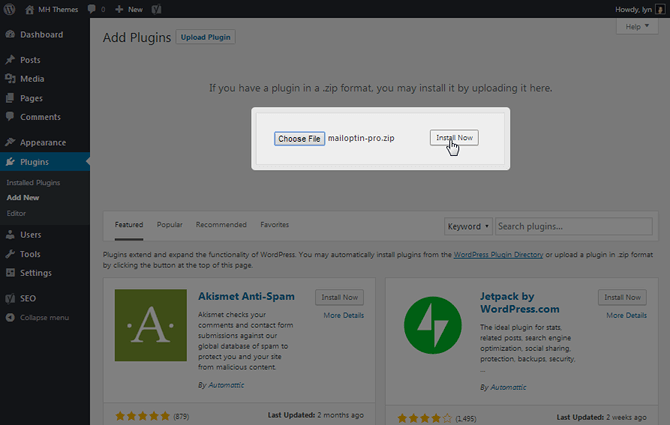 Installing this plugin is as simple as installing any other plugin. 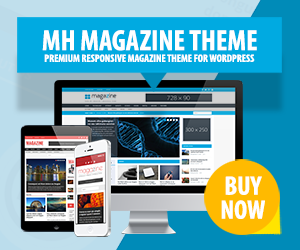 You simply install the free version directly inside the WordPress admin area or upload the ZIP folder for the premium version. If you plan on using the premium version, be sure to grab your license key. You can click the “Activate Your License Key” link when it appears to activate it. The main settings page itself is fairly straightforward. 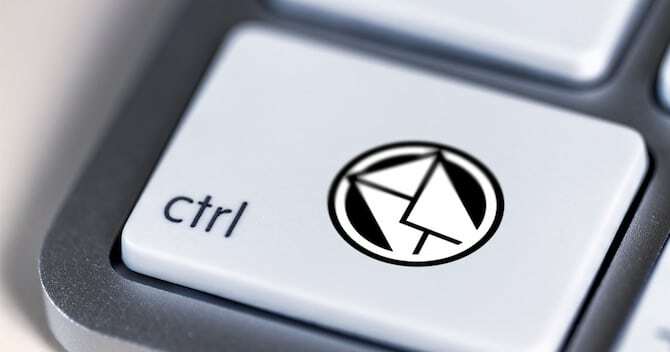 It contains simple settings that allow you to enable anonymous tracking and choose whether or not you'd like MailOptin to remove all of its data when you uninstall it. You can also clear the plugin's cache, edit the message that appears at the bottom of emails and configure your information for email campaigns (name displayed to subscribers, email address, etc.). Therefore, it contains all you need to configure this plugin. You'll integrate your email marketing service provider in another tab called Connections. All you need to do is paste your service provider's API key and click Save Changes. Let's move on with our MailOptin review. 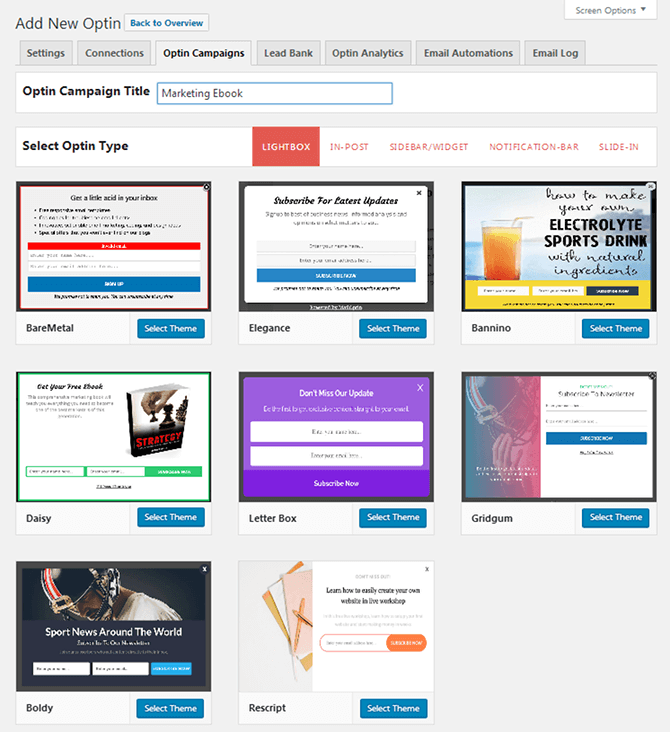 Creating optin campaigns is simple. You'll begin by selecting the type of form you'd like to create followed by the template you'd like to use. When you select a template, you'll trigger the plugin's frontend builder. This builder allows you to customize the design and functionality of your form. You can customize its colors, add custom CSS styles, change the text and change a few technical settings. This includes a “Cookie Duration” setting that allows you to control the amount of time (in days) that passes before a form is displayed to a returning visitor depending on whether or not they've interacted with the form. You can also control what happens after a visitor has opted in and change just under a dozen display rules. This includes page-level targeting, user-level targeting, exit intent and more. Overall, I found this process to be incredibly straightforward and easy to use. It allows you to create different forms that have different styles, different goals and different display strategies. A variety of all of these is an important component of a strong email marketing strategy. As a result, this plugin makes it easy for anyone to implement them on their site. 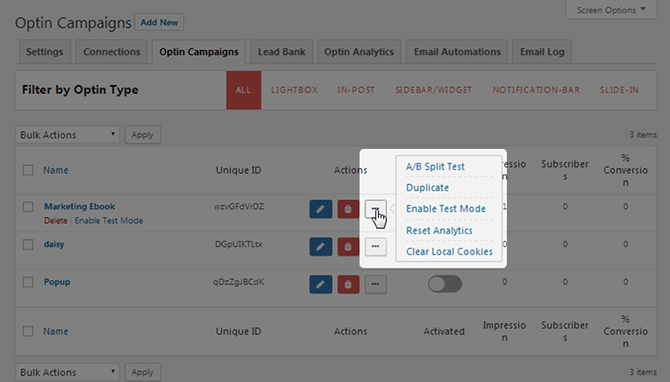 A few of the features I mentioned in the Overview section can be used by performing “Actions” in the Optin Campaigns section. All you need to do is click on the button that triggers a pop-up menu for the optin campaign you'd like to perform an action on. The A/B Split Test action is useful when you're not sure which styles, effects, display rules or even lead magnets are more effective. It takes the guesswork out by duplicating your form and allowing you to change these settings. While you can't change every setting, you can change enough to create an entirely new form that uses the same template and optin type. The Duplicate action is useful when you want to create a similar campaign for a new lead magnet but don't want to go through the trouble of creating one from scratch. The Enable Test Mode action is useful when your form fails to appear on your site. Test Mode causes your form to appear on your site regardless of any display rules you've set. This can help you determine the cause of the form not appearing on your site. The Reset Analytics and Clear Local Cookies settings are self-explanatory, but they can be useful when your data has been tainted, such as by bots or your own testing. MailOptin has a feature I didn't mention earlier. It's called Lead Bank. It's a simple collection of all of the leads you capture that don't get sent to an email marketing service provider. If you look closely at that screenshot, you'll notice a button that says “Export All Leads”. This means you can start using this plugin today even if you don't have an email marketing service provider and don't wish to integrate it quite yet. All you need to do is export the leads you capture from the Lead Bank. You can then import them to the email list you've built with your email marketing service provider when you're ready. 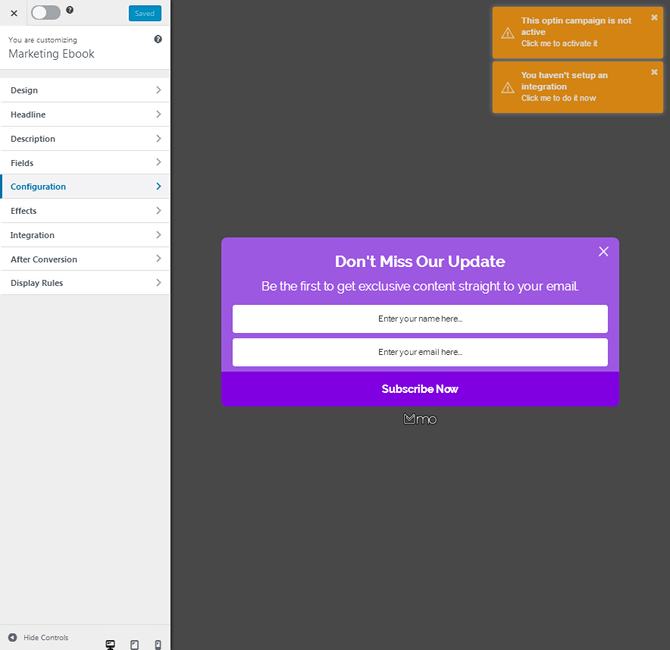 So far, the only email automation you can create is the New Post Notification email automation, but this is to be expected as MailOptin is a lead generation software, not an email marketing service provider. Currently, this automation has one template (Lucid), which you can customize with predefined settings and custom CSS. In the Automation Settings section, you can choose whether or not to display the full post. If you wish to only display an excerpt, you can choose how many words are displayed. You can also choose which categories this automation sends posts from as well as how long after the post has been published the email is sent. By creating multiple email automations, these two settings can help you strategize the way you send notifications about new posts. Note: This article was published in April 2018. The prices stated in this review may not reflect current pricing for MailOptin. As a reminder, MailOptin does come in a free version. It comes with limited features and only allows you to create three optin campaigns. However, it's more than enough to get you going if your budget is tight. 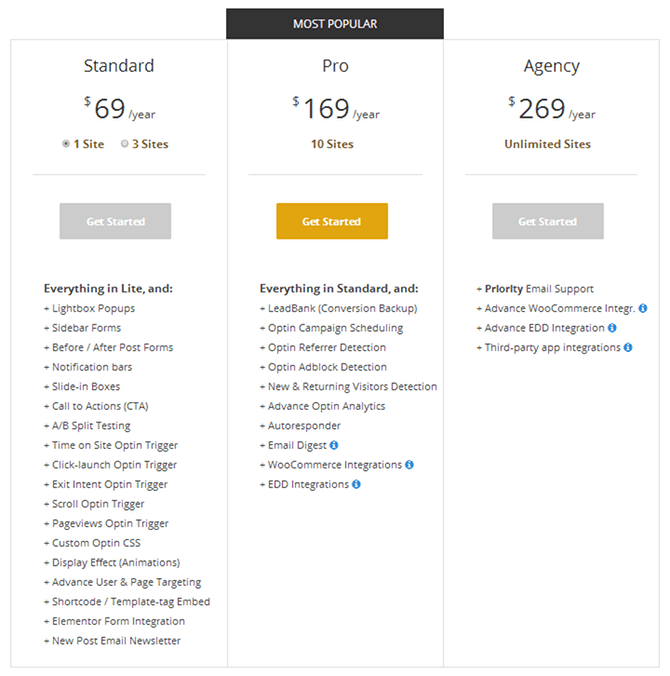 Pricing for the premium version starts at $69 / year. This plan comes with most of the features you'll need. Refunds are also available within 14 days of purchase. Support is available in the form of a ticket system, but Agency customers have access to priority email support. Not sure if the premium version is for you? Visit MailOptin, and select Take Test Drive to grab a demo account. What do you think about MailOptin? Please let us know in the comments. Disclosure: This MailOptin plugin review has been sponsored by MailOptin. The statements and opinions are our own.